Dani joined the Medieval Swordsman Guild of Kansas City four years ago. During this time, she has trained with many modern day experts the field of historic European martial arts. Prior to becoming involved in swordsmanship, Dani had years of experience with other martial arts including boxing, kickboxing, and taekwondo. Additionally, extensive dance training in tap, jazz, and ballet have provided her with a solid understanding kinesthetic instruction and the use of muscle memory. Moreover, Dani’s administrative skills, carefully honed as a small business owner, make her an ideal candidate to lead the curriculum and instruction team. Bruce has pursued an interest in armored combat for many decades. Equally fascinated with armor, at the age of nineteen Bruce learned from the best armorers at that time in the Kansas City area. As an armored combatant he has participated in HEMA tournaments east of the Rockies in the United States and Canada. Bruce joined the Guild shortly after its founding and has been part of the training team for the last decade. Like our other instructors, he has had the opportunity to work with many of the modern day experts in the field. Due to his extensive professional experience as an adult educator, Bruce particularly excels at and enjoys working with novices and students with disabilities. Ben joined the Medieval Swordsman Guild of Kansas City four years ago. During this time, he has studied with modern day experts the field of historic European martial arts. Ben has also experience in judo, boxing, and taekwondo. Ben is part of the duo that produces the “Pursuing the Knightly Arts” YouTube channel. As a scholar he studies surviving period manuscripts. Then slowly and deliberately he works through the physical mechanics of each move until he gets it just right. Some might label his approach as experimental archaeology. Few hobbyists possess such thorough understanding of and passion for their subject matter. Richard is the most recent addition to the Guild instructional team. Richard has long been interested in martial arts having earned a first degree black belt in taekwondo. 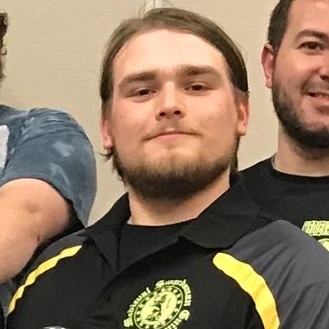 Like other members of the instructional team he has trained with some of the top historic European martial arts scholars and instructors in the nation. Most recently Richard was invited to be a guest instructor for a central corridor regional educational event. Our instructors have practiced medieval swordsmanship for many years. They intensely study and analyze period manuscripts as well as secondary sources. They travel to seminars and events regularly to exchange ideas with other subject matter experts. Training is primarily geared toward the teachings of German Master Johannes Liechtenauer. Classes are geared toward student needs, with breakout groups for differing levels of experience. As with all sports, muscle memory is critical to success in competition. It is recommended that more advanced students purchase their own equipment to practice at home. Classes are planned in advance with formal curriculum at their core. Subject matter experts - Brett Boston, Athletic Trainer and Sarah Rawitch-Clonts, 200 Hour Therapeutic Yoga Instructor and Dance Instructor - have aided in developing a warm up curriculum to both strengthen and stretch the body.